If you only have a postage stamp Garden or no garden at all and want to grow your own Vegetables then an Allotment may be just what you need. The joy of Allotments is they are specifically for keen Growers and those existing growers have usually formed a goof close friendly community. Add to that there's a wealth of experience and knowledge amongst them, you could soon find yourself in the popular Allotment Show Competitions! The only problem you may find is actually getting one, many have waiting lists of three years, so it's a case of waiting for someone to move away to another town or to that Great Vegetable Plot in the Sky. 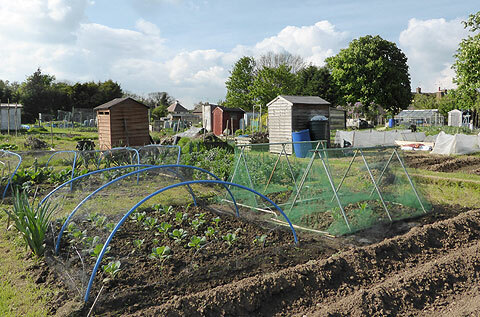 To cater for so much demand (there are 300,00 Plots in this country and 90,000 on the waiting lists) some Allotments are now carrying out a policy that if one becomes vacant, they will split that Plot into half, a third or four quarters. To be fair, for the average household a full Plot is more than they need plus the smaller Plot will be easier to manage. It's a pity that in some cases people take over a Plot, really keen, full of ideas but after a year the realization that they do need quite a few hours work every week, they forget about it and the land goes to rack and ruin. To counter this some Allotments and Councils have a policy that should a Plot go un kept for more than one or two years, they will evict that person and make it available. It is hard to find places where you'll see so much frugality and re-cycling in action from Sheds made from Pallets to Benches, Tables and almost anything else a keen person will look at before discarding it into the Bin! 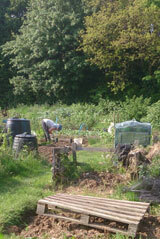 Take away the occasional plastic netting, tools etc. you're almost stepping back in time to WW2 when people got together with the mission of 'Dig for Victory'. Speaking of which, a great source of information can be found in Home Front books or Videos. For some good tips and regular video up-dates go to the Horticultural Channel Page on the is Site where Sean James Cameron automatically up-dates his monthly Show. For further information go to the National Allotment Society Website or your local Government web site and type in 'Allotments'.